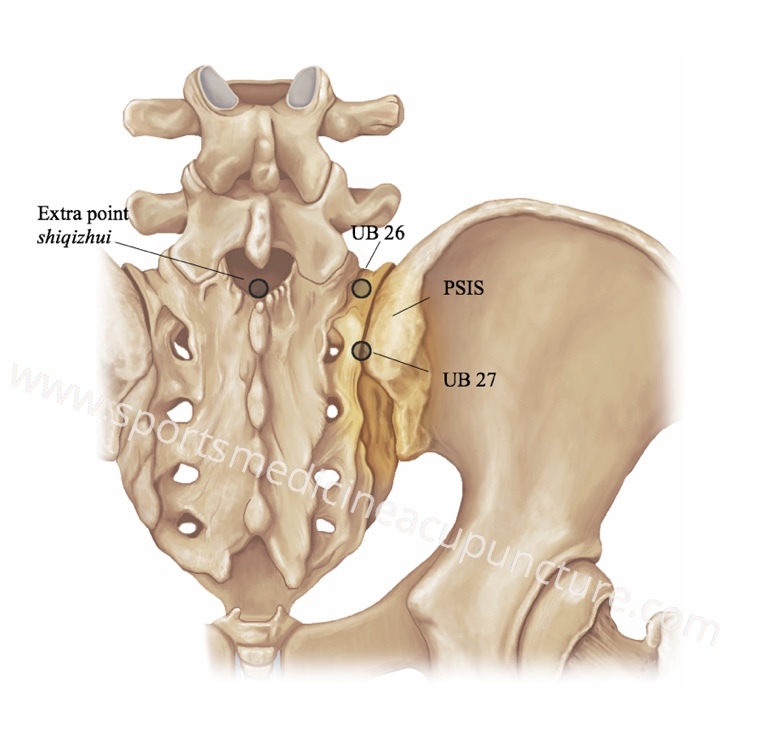 Figure A. UB 26 and UB27 are located in very close proximity to the sacroiliac joint. The PSIS covers approximately the upper half of the sacroiliac joint. Sacroiliac joint pain (SIJ) is a common injury, which the patient will often seek help from an acupuncturist. 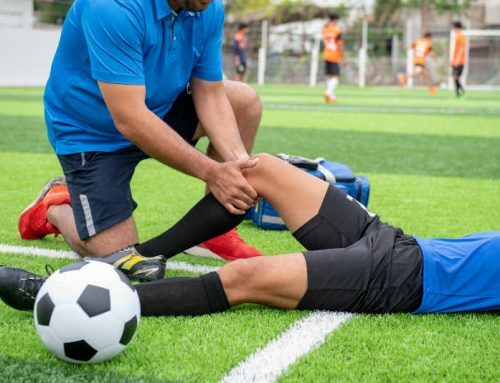 This brief article will present a basic Sports Medicine Acupuncture assessment and treatment approach that examines postural and myofascial tissue imbalances determined through functional assessment and treated by acupuncture channel theory. SIJ pain is usually the result of dysfunction in the motion of the sacroiliac joint frequently due to the combination of faulty movement patterns combined with pelvic and myofascial channel imbalances. It is difficult to state specific imbalances that are consistent with SIJ pain; however, it is common to find some combination of an elevated ilium, a pelvic tilt and/or a pelvic rotation. The pelvic imbalance(s) related to sacroiliac joint pain and dysfunction will always have associated channel imbalances that will need to be assessed and treated. 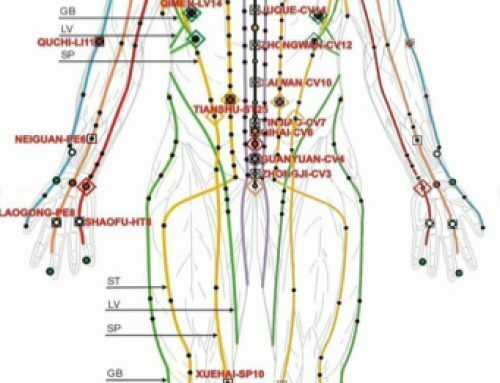 The practitioner should examine the myofascial sinew (jing jin), the primary channels (jing luo) and also the extraordinary vessels (qi jing ba mai) in order to treat the appropriate layer of the myofascial planes where these channels and vessels reside. Additional information on these imbalances will be discussed in future blog posts. Figure B. 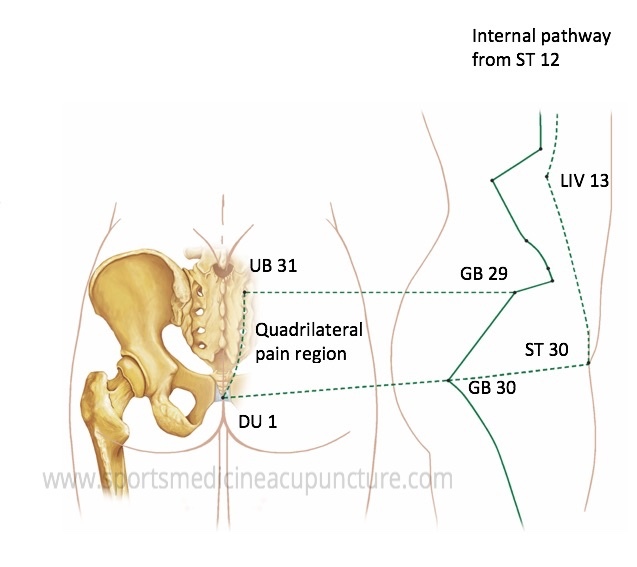 The quadrilateral shape made by the Gallbladder internal and external pathway from GB 29 to GB 30 is a common area of gluteal pain associated with SIJ injury. The Gallbladder channel has a unique relationship with the sacroiliac joint, which is revealed by examining pelvic motion and the myofascial tissues that are traversed by the topography of the Gallbladder primary and sinew channels (jing luo jing jin). The internal pathway of the Gallbladder channel also has a descending branch from ST 12 (quepen) that connects with LIV 13 (zhangmen). From LIV 13, the internal pathway follows the external oblique muscle fibers to meet ST 30 (qichong). As discussed previously, sacroiliac joint pain is frequently accompanied by pelvic imbalances including a pelvic tilt and pelvic rotation. With a pelvic tilt, the pubic bone of one innominate bone is higher than the pubic bone on the opposite side. The practitioner can measure the alignment of the pubic bones by placing a finger on both the left and right qichong points and comparing their relative positions. It is often the case that the qichong point on the same side as the sacroiliac joint pain will have more ashi point tenderness. When a patient presents with sacroiliac joint pain and a pelvic rotation, both left and right GB 26 (daimai) points (motor points of the internal oblique) and left and right zhangmen points (motor points of the external oblique), will be tender to palpation as these muscle groups are shortened and lengthened on opposite sides of the body. The point tenderness at these points will decrease substantially after the pelvic imbalances have been addressed with acupuncture treatment. When assessing and differentiating sacroiliac joint pain, the practitioner will need to move the SIJ to determine if the sacroiliac joint and/or ligaments are the source of the pain. There are several orthopedic tests that can be used to reproduce sacroiliac joint pain. Other examinations are useful for the practitioner that detect pelvic imbalances and have contributed to sacroiliac joint dysfunction. It is good practice to use more than one orthopedic test to help improve the probability of correctly diagnosing the condition. For this article, we will use the Posterior Shear test (Fig. C) and Gillet’s test (Fig. D). Figure C. Posterior Shear Test. This test examines for sacroiliac joint pain. A) Practitioner’s hand is placed under the patient’s sacrum. B) The patient is then placed into a supine position with the practitioner’s hand kept in place on the sacrum. An anterior to posterior force is applied to the femur assessing for pain on the same side. Figure D. Gillet’s Test. This exam of for sacroiliac joint dysfunction (fixation) that can lead to pain. A) Starting position with thumbs placed on both PSIS’s. B) Thumb on the right side falls as the right hip is flexed to 90˚-100˚, indicating normal pelvic movement. C) Thumb on the right rises as the right hip is flexed to 90˚-100˚, indicating a sacroiliac fixation on that side. The following treatment strategy includes points on the abdomen as part of the Gallbladder channel internal and external pathway, an Extraordinary Vessel point combination and also a local treatment to the fixed pain site found under the PSIS. As mentioned previously, pelvic imbalance(s) related to sacroiliac joint pain and dysfunction will always have associated myofascial channel imbalances that need to be assessed and treated. The practitioner should perform a thorough functional exam and also a TCM differential diagnosis in order to complete a more comprehensive point prescription. The following points on the abdomen will often develop ashi point tenderness in the presence of sacroiliac joint pain and dysfunction. The practitioner should assess these points with palpation and include them in the treatment protocol if they are tender. ST 30 (qichong)—When this point is found to be excess, it is often associated with a pelvic tilt found on the side of sacroiliac joint pain. Treat this point using a xie fa or reducing needle technique. GB 29 (juliao)—This point is often found to be excess on the side of sacroiliac joint pain. Treat this point using a xie fa needle technique. GB 26 (daimai)—Treat this point using a xie fa needle technique on the side of forward pelvic rotation, as this point will be excess due to a shortened internal oblique. Treat the opposite GB 26 with a bu fa or reinforcing needle technique due to the lengthened internal oblique. LIV 13 (zhangmen)—Treat this point using a bu fa needle technique on the side of forward pelvic rotation, as this point will be deficient due to a lengthened external oblique. Treat the opposite LIV 13 with a xie fa needle technique due to the shortened external oblique. The author has reported and demonstrated over the last 20 years of clinical practice that pelvic motion seems to be directly related to the Dai Mai and Yang Wei Mai. The influence of these extraordinary vessels has a remarkable effect on the myofascial channels and pelvic motion. This can be observed with performing Gillet’s test before and after acupuncture treatment to the master and coupled points of these two vessels GB 41 (zulinqi) and SJ 5 (waiguan). 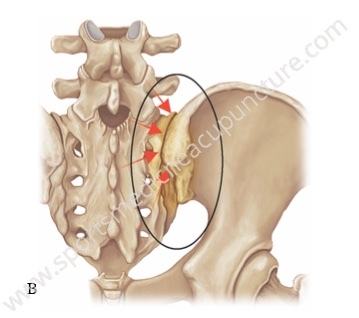 The goal of this needle technique is to stimulate the myofascial tissues that cover the sacroiliac joint. A) The 2nd-4th fingers palpating the medial border of the PSIS that covers the upper half of the sacroiliac joint. B) The PSIS can be divided into four sections. Arrows indicate direction of palpation under PSIS. C) Practitioner palpates these vectors under the PSIS examining for the 1 – 2 most tender ashi points. D) Insert a needle into the most reactive point(s), directed under the PSIS and into the posterior sacroiliac joint ligaments. The reader is encouraged to come back to the SMA blog as well as visit Anatomy of the Sinew Channels presented by Brian Lau, AP, C.SMA for complimentary information on musculoskeletal injury and the channel sinews (jingjin). 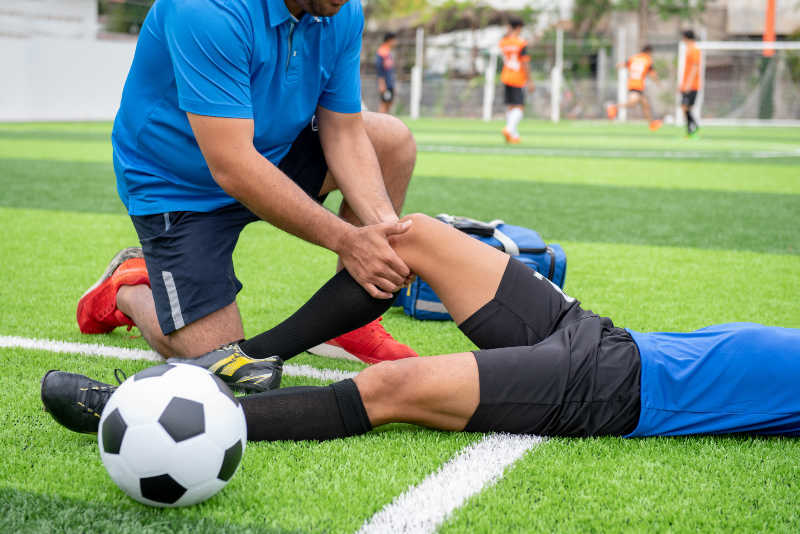 For the most in-depth understanding of the assessment and treatment of sacroiliac joint pain and dysfunction for the TCM practitioner, refer to courses taught in the Sports Medicine Acupuncture Certification Program. 1. Slipman CW, Jackson HB, Lipetz JS. Sacroiliac joint pain referral zones. Arch Phys Med Rehabili. 2000; 8(3): 334-338.